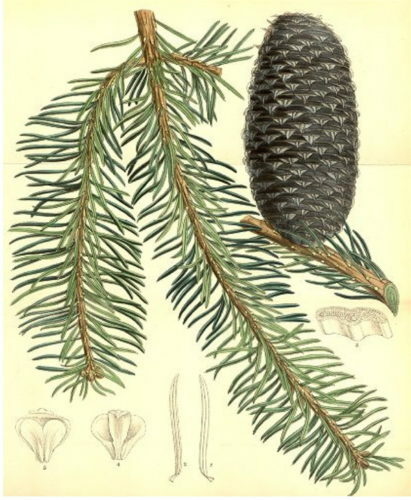 Abies religiosa, first described by Carl Sigismund Kunth (1788–1850), and work later completed 1830 by Diederich Franz Leonhard von Schlechtendal (1794 - 1866) and Adelbert von Chamisso (1781 - 1838), is commonly known as Sacred fir or as oyamel in the native Nahuatl language and as pinabete in Spanish. Sacred fir is named after the use of cut foliage in religious festivals in Mexico, notably at Christmas. It is also the preferred tree for the monarch butterfly (Danaus plexippus) to reside in colonies during its hibernation in Mexico. Description. 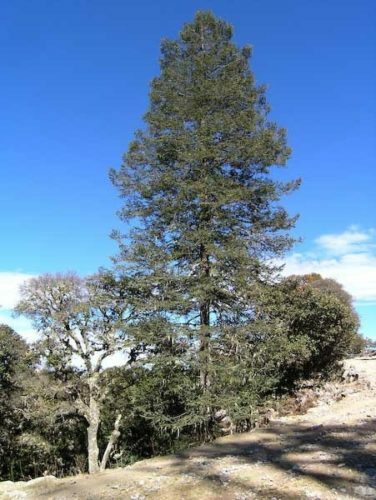 Sacred fir is an evergreen coniferous species of tree that will grow to heights of 80 to 160 feet (25 – 50 m) tall with a trunk diameter of up to 6.6 feet (2 m) wide at breast height. The leaves are needle-like, flattened, 0.6 to 1.4 inches (1.5 – 3.5 cm) long and 0.06 inch (1.5 mm) wide by 0.02 inch (0.5 mm) thick, dark green above, and with two Blue-white bands of stomata below; the leaf apex is acute. The leaf arrangement is spiral on the shoot, but with each leaf variably twisted at the base so they lie flat to either side of and above the shoot, with none below the shoot. The shoots are reddish-brown, hairless or with scattered pubescence. The seed cones are 3 to 6.5 inches (8 – 16 cm) long and 1.6 to 2.4 inches (4 – 6 cm) broad, dark Blue-purple when you; the scale bracts are purple or greenish, of moderate length, with the tips exposed in the closed cone. 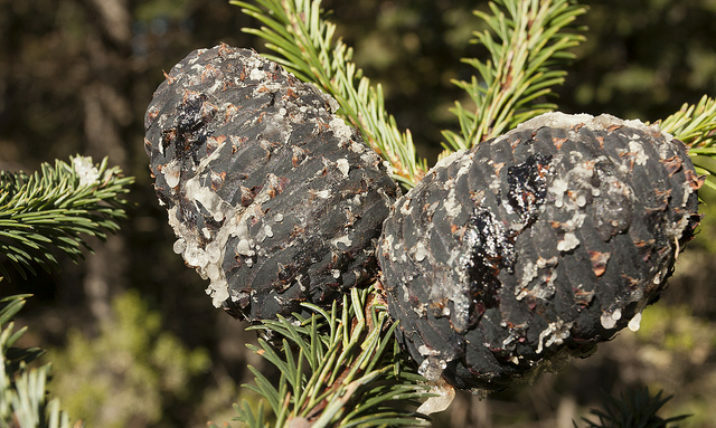 The winged seeds are released when the cones disintegrate at maturity about 7 to 9 months after pollination. Distribution. This species is native to the mountains of central and southern Mexico — Eje Volcánico Transversal, Sierra Madre del Sur; and western Guatemala. It grows at high elevations of 6,900 to 13,500 feet (2,100 – 4,100 m) above sea level in cloud forests with high rainfall, cool, humid summers and dry winters in most of its habitat with the exception of the state of Veracruz to the east where grows with precipitation all year long. Regular winter snowfalls occur on the highest populations. Abies religiosa — a closeup of foliage and seed cone detail. Abies religiosa — Large tree in an arroyo, just outside of Ejido La Encantada, Mexico.